General Dynamics Land Systems–UK and General Dynamics European Land Systems will showcase the EAGLE 6x6, which will shortly enter trials for a part of the UK’s Multi Role Vehicle –Protected (MRV-P) programme, at Defence and Security Equipment International (DSEI). GDLS-UK says EAGLE, fitted as an ambulance variant at DSEI 2017, provides a unique suspension and driveline, offering superior tactical mobility, reliability and the highest-protection in its class. The EAGLE is in-service with the German, Swiss and Danish Armies. It is available in 4×4 and 6×6 configurations and can fulfil roles such as a troop carrier, recovery, command, reconnaissance and logistics. EAGLE provides logistic commonality across its range of variants to offer lower maintenance and lifecycle costs. 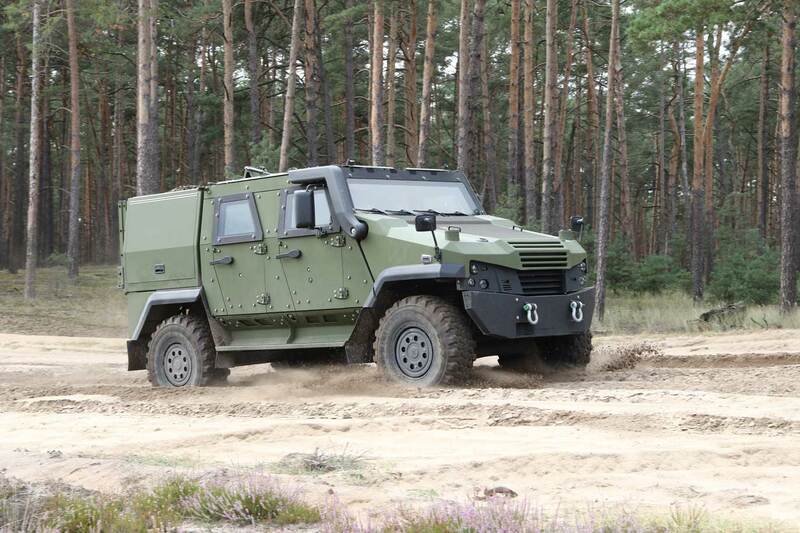 An ambulance and a troop-carrying vehicle, based on the same EAGLE 6x6 chassis and driveline, are being provided for trials. A third platform will be used for a mine blast trial. Trials will begin in October 2017 and are planned to run until February 2018. Kevin Connell, vice president of General Dynamics Land Systems–UK, says the EAGLE 6x6 is an excellent example of a high performance, highly survivable, tactical wheeled vehicle ideally suited to troop transport and the rapid, safe carriage of injured personnel. GDLS-UK will integrate and test EAGLE platforms for the British Army, alongside in-service support, at its new Merthyr Tydfil facility. General Dynamics Land Systems has a long pedigree and worldwide experience in delivering tracked and wheeled military vehicles, including the AJAX, the Abrams main battle tank, PIRANHA, and LAV (Light Armoured Vehicle), Stryker and Cougar MRAP (Mine Resistant Ambush – Protected) vehicles. GDLS-UK will also showcase at DSEI training solutions for the British Army as part of the AJAX programme. These solutions, include an ‘immersive’ Crew Turret Trainer and the AJAX Desk Top Trainer. The training solutions will cover gunnery and intelligence, surveillance, target acquisition and reconnaissance, driver procedure and maintenance, and Level 2/3 maintenance. Crew Turret Trainer (CTT): Developed by Lockheed Martin UK, in partnership with General Dynamics Land Systems–UK, the CTT is self-contained within a 20-foot ISO container and includes a representative AJAX turret, which will replicate its systems and their functionality within a static, physical environment. All sensor views are simulated and the crews will operate in an immersive synthetic environment. The CTT consolidates classroom-based training in an environment that reflects the experience of the real vehicle. “This training enables the British Army to maximise the use of the first fully-digitised fleet of vehicles across all environments on future operations,” said Connell of General Dynamics Land Systems–UK. The range of AJAX variants will enable British Army Strike Brigades to conduct sustained, expeditionary, full-spectrum and network-enabled operations with a reduced logistics footprint. They will operate in combined-arms and multinational situations across a wide-range of future operating environments.